Command Look closely! / Pick! Sleight of Hand is one of Orbulon's microgames in WarioWare: Twisted! 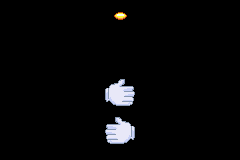 When the game starts, the player will see two hands, one of which is holding a coin. After a short period of time, the hands will move, and the one holding the coin will throw it in the air. The player has to keep his or her eye on the coin to see which hand catches it. If he or she chooses the correct hand, the game is won. However, if he or she chooses the incorrect hand, the game is lost. 1st level difficulty: It's easy to spot where the coin goes. 2nd level difficulty: The hands spin around quickly until the coin is caught. 3rd level difficulty: The hands spin around quickly before catching the coin, and continue to spin for a brief moment afterwards.